Note: Following OSHA Standard strictly could leave you and your company with a liability should an accident occur. Check with your local building department for any changes that go above and beyond the OSHA Standard. 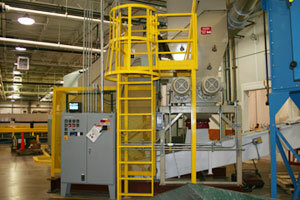 The minimum design live load shall be a single concentrated load of 200 pounds. The number and position of additional concentrated live-load units of 200 pounds each as determined from anticipated usage of the ladder shall be considered in the design. The live loads imposed by persons occupying the ladder shall be considered to be concentrated at such points as will cause the maximum stress in the structural member being considered. The weight of the ladder and attached appurtenances together with the live load shall be considered in the design of rails and fastenings. "Design stresses." Design stresses for wood components of ladders shall not exceed those specified in 1910.25. 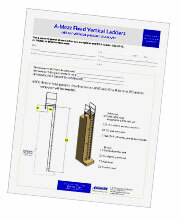 All wood parts of fixed ladders shall meet the requirements of 1910.25(b). For fixed ladders consisting of wood side rails and wood rungs or cleats, used at a pitch in the range 75 degrees to 90 degrees, and intended for use by no more than one person per section, single ladders as described in 1910.25(c)(3)(ii) are acceptable. All rungs shall have a minimum diameter of three-fourths inch for metal ladders, except as covered in paragraph (b)(7)(i) of this section and a minimum diameter of 1 1/8 inches for wood ladders. The distance between rungs, cleats, and steps shall not exceed 12 inches and shall be uniform throughout the length of the ladder. The minimum clear length of rungs or cleats shall be 16 inches. Rungs, cleats, and steps shall be free of splinters, sharp edges, burrs, or projections which may be a hazard. The rungs of an individual-rung ladder shall be so designed that the foot cannot slide off the end. A suggested design is shown in figure D-1. "Side rails." Side rails which might be used as a climbing aid shall be of such cross sections as to afford adequate gripping surface without sharp edges, splinters, or burrs. "Fastenings." Fastenings shall be an integral part of fixed ladder design. "Splices." All splices made by whatever means shall meet design requirements as noted in paragraph (a) of this section. All splices and connections shall have smooth transition with original members and with no sharp or extensive projections. "Electrolytic action." Adequate means shall be employed to protect dissimilar metals from electrolytic action when such metals are joined. "Welding." All welding shall be in accordance with the "Code for Welding in Building Construction" (AWSD1.0-1966). Metal ladders and appurtenances shall be painted or otherwise treated to resist corrosion and rusting when location demands. Ladders formed by individual metal rungs imbedded in concrete, which serve as access to pits and to other areas under floors, are frequently located in an atmosphere that causes corrosion and rusting. To increase rung life in such atmosphere, individual metal rungs shall have a minimum diameter of 1 inch or shall be painted or otherwise treated to resist corrosion and rusting. Wood ladders, when used under conditions where decay may occur, shall be treated with a nonirritating preservative, and the details shall be such as to prevent or minimize the accumulation of water on wood parts. When different types of materials are used in the construction of a ladder, the materials used shall be so treated as to have no deleterious effect one upon the other. "Climbing side." On fixed ladders, the perpendicular distance from the centerline of the rungs to the nearest permanent object on the climbing side of the ladder shall be 36 inches for a pitch of 76 degrees, and 30 inches for a pitch of 90 degrees (fig. D-2 of this section), with minimum clearances for intermediate pitches varying between these two limits in proportion to the slope, except as provided in subparagraphs (3) and (5) of this paragraph. "Ladders without cages or wells." A clear width of at least 15 inches shall be provided each way from the centerline of the ladder in the climbing space, except when cages or wells are necessary. "Ladders with cages or baskets." Ladders equipped with cage or basket are excepted from the provisions of subparagraphs (1) and (2) of this paragraph, but shall conform to the provisions of paragraph (d)(1)(v) of this section. Fixed ladders in smooth-walled wells are excepted from the provisions of subparagraph (1) of this paragraph, but shall conform to the provisions of paragraph (d)(1)(vi) of this section. "Clearance in back of ladder." The distance from the centerline of rungs, cleats, or steps to the nearest permanent object in back of the ladder shall be not less than 7 inches, except that when unavoidable obstructions are encountered, minimum clearances as shown in figure D-3 shall be provided. "Clearance in back of grab bar." The distance from the centerline of the grab bar to the nearest permanent object in back of the grab bars shall be not less than 4 inches. Grab bars shall not protrude on the climbing side beyond the rungs of the ladder which they serve. "Step-across distance." The step-across distance from the nearest edge of ladder to the nearest edge of equipment or structure shall be not more than 12 inches, or less than 2 1/2 inches (fig. D-4). "Hatch cover." Counterweighted hatch covers shall open a minimum of 60 degrees from the horizontal. The distance from the centerline of rungs or cleats to the edge of the hatch opening on the climbing side shall be not less than 24 inches for offset wells or 30 inches for straight wells. There shall be no protruding potential hazards within 24 inches of the centerline of rungs or cleats; any such hazards within 30 inches of the centerline of the rungs or cleats shall be fitted with deflector plates placed at an angle of 60 degrees from the horizontal as indicated in figure D-5. The relationship of a fixed ladder to an acceptable counterweighted hatch cover is illustrated in figure D-6. Cages or wells (except on chimney ladders) shall be built, as shown on the applicable drawings, covered in detail in figures D-7, D-8, and D-9, or of equivalent construction. Cages or wells (except as provided in subparagraph (5) of this paragraph) conforming to the dimensions shown in figures D-7, D-8, and D-9 shall be provided on ladders of more than 20 feet to a maximum unbroken length of 30 feet. Cages shall extend a minimum of 42 inches above the top of landing,unless other acceptable protection is provided. Cages shall extend down the ladder to a point not less than 7 feet nor more than 8 feet above the base of the ladder, with bottom flared not less than 4 inches, or portion of cage opposite ladder shall be carried to the base. Cages shall not extend less than 27 nor more than 28 inches from the centerline of the rungs of the ladder. Cage shall not be less than 27 inches in width. The inside shall be clear of projections. Vertical bars shall be located at a maximum spacing of 40 degrees around the circumference of the cage; this will give a maximum spacing of approximately 9 1/2 inches, center to center. Ladder wells shall have a clear width of at least 15 inches measured each way from the centerline of the ladder. Smooth-walled wells shall be a minimum of 27 inches from the centerline of rungs to the well wall on the climbing side of the ladder. Where other obstructions on the climbing side of the ladder exist, there shall be a minimum of 30 inches from the centerline of the rungs. "Landing platforms." When ladders are used to ascend to heights exceeding 20 feet (except on chimneys), landing platforms shall be provided for each 30 feet of height or fraction thereof, except that, where no cage, well, or ladder safety device is provided, landing platforms shall be provided for each 20 feet of height or fraction thereof. Each ladder section shall be offset from adjacent sections. Where installation conditions (even for a short, unbroken length) require that adjacent sections be offset, landing platforms shall be provided at each offset. Where a man has to step a distance greater than 12 inches from the centerline of the rung of a ladder to the nearest edge of structure or equipment, a landing platform shall be provided. The minimum step-across distance shall be 2 1/2 inches. All landing platforms shall be equipped with standard railings and toeboards, so arranged as to give safe access to the ladder. Platforms shall be not less than 24 inches in width and 30 inches in length. One rung of any section of ladder shall be located at the level of the landing laterally served by the ladder. Where access to the landing is through the ladder, the same rung spacing as used on the ladder shall be used from the landing platform to the first rung below the landing. "Ladder extensions." The side rails of through or side-step ladder extensions shall extend 3 1/2 feet above parapets and landings. For through ladder extensions, the rungs shall be omitted from the extension and shall have not less than 18 nor more than 24 inches clearance between rails. For side-step or offset fixed ladder sections, at landings, the side rails and rungs shall be carried to the next regular rung beyond or above the 3 1/2 feet minimum (fig. D-10). "Grab bars." Grab bars shall be spaced by a continuation of the rung spacing when they are located in the horizontal position. Vertical grab bars shall have the same spacing as the ladder side rails. Grab-bar diameters shall be the equivalent of the round-rung diameters. "Ladder safety devices." Ladder safety devices may be used on tower, water tank, and chimney ladders over 20 feet in unbroken length in lieu of cage protection. No landing platform is required in these cases. All ladder safety devices such as those that incorporate lifebelts, friction brakes, and sliding attachments shall meet the design requirements of the ladders which they serve. "Preferred pitch." The preferred pitch of fixed ladders shall be considered to come in the range of 75 degrees and 90 degrees with the horizontal (fig. D-11). "Substandard pitch." Fixed ladders shall be considered as substandard if they are installed within the substandard pitch range of 60 and 75 degrees with the horizontal. Substandard fixed ladders are permitted only where it is found necessary to meet conditions of installation. This substandard pitch range shall be considered as a critical range to be avoided, if possible. "Scope of coverage in this section." 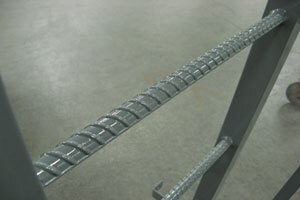 This section covers only fixed ladders within the pitch range of 60 degrees and 90 degrees with the horizontal. "Pitch greater than 90 degrees." Ladders having a pitch in excess of 90 degrees with the horizontal are prohibited. "Maintenance." All ladders shall be maintained in a safe condition. 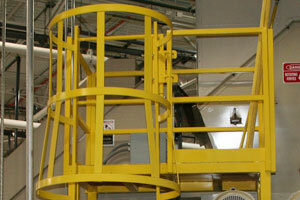 All ladders shall be inspected regularly, with the intervals between inspections being determined by use and exposure. This information is copied from OSHA's website. A-Mezz Industrial Structures is not responsible for the accuracy of this information. This information is meant to serve as guide, not the authority of the OSHA standard. For additional OSHA clarification please visit OSHA's website at http://www.osha.gov. You can also visit our permanent wall mounted ladder section to learn more about how we can supply you a customized ladder to meet OSHA standards for your specific site conditions.